Hey peeps! It's Mama Elephant August Stampede time! Have you been keeping up with the peeks over on the Mama Elephant blog? Well, they're all loaded and ready to go at the Mama Elephant store! For this month's stampede, I'm working with the new set Message Bands! This set is perfect for a CAS gal like me, but can't you see these used with photographs? For my project, I made a sweet little baby card:) My need for baby cards seems to go in waves and lately, it's been a tsunami! (What was 8 months ago? lol) So I paired up the "Whoa Baby!" 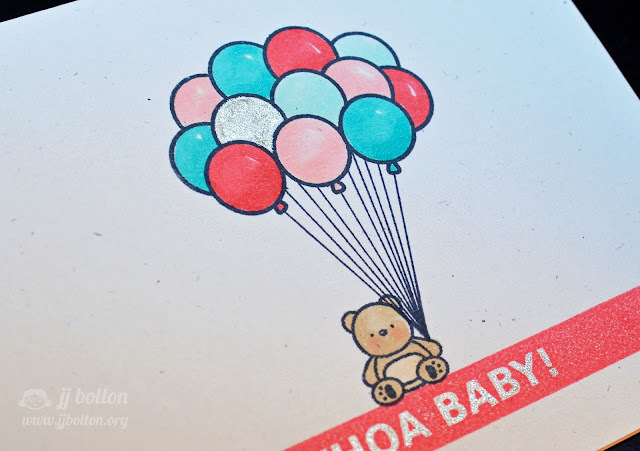 stamp from Message Bands with the teeny baby bear of Nursery Deco and the balloon bouquet of Up and Away. Who can resist a mini bear holding a bouquet of balloons? To celebrate the new release, Mama Elephant is giving away 3 gift certificates worth $20 each to 3 lucky people! Winners will be chosen at random from the collective blogs in the Stampede. Winners will be announced on the blog on the last Stamp Highlight day. Thank you so much for stopping by!! And remember, tomorrow we start the stamp highlights so you can get to know each set better! Lots of fun coming! aww this is so SWEET.. i love it..
Adorable card!! Great stamp set! So cute! I love how well all of these sets work together!! Yes, yes, yes! I love how you combined a sweet image with a humorous sentiment. Pinning this for sure!!! Wow, I j'adore this card! SO SWEET!!! This is so cute. And I just LOVE the glittered balloon! JJ this is so cute! I love the color combo you used! Super sweet! Love the colors and that cute little bear. So cute JJ! Love this sentiment and how you paired it with that little bear! I just love this card... looking forward to the release. Absolutely darling card, JJ! This little bear is adorable sitting on the sentiment...beautiful color combo, too! Super cute JJ! Love the glitter in just one balloon. Such an adorable baby card. I am a follower of the ME Blog. I liked the ME on Facebook. That little teddy is so pudgy sweet. Love the touch of glitter too. VEry cute baby card. I like the glittery balloon. Such a sweet card. The Message Bands are cool. I love how you combined these sets in this sweet baby card. Those balloons always remind me of the movie 'Up,' which I love. I like that you made one of them sparkly too. I already follow ME's blog. I am already a Mama Elephant FB fan as well. This is super adorable! Love how you combined the different sets! 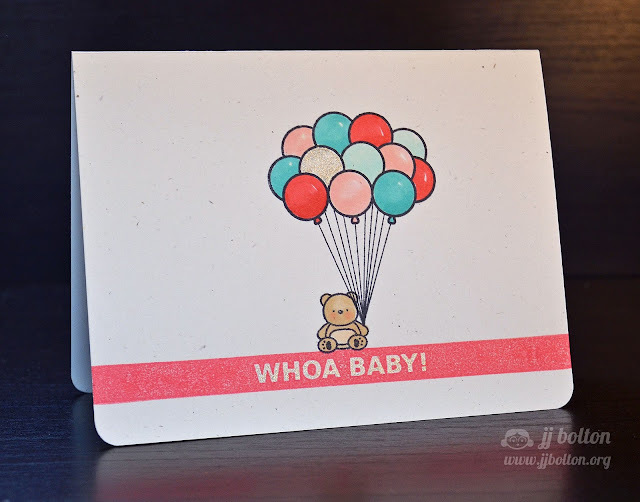 What an adorable baby card - so fun! What a fun card to make and to receive! What a cute baby card! I love mama elephant stamps! Thanks for a chance to win them. My fave set is Stitches! ~God bless~ Great card! 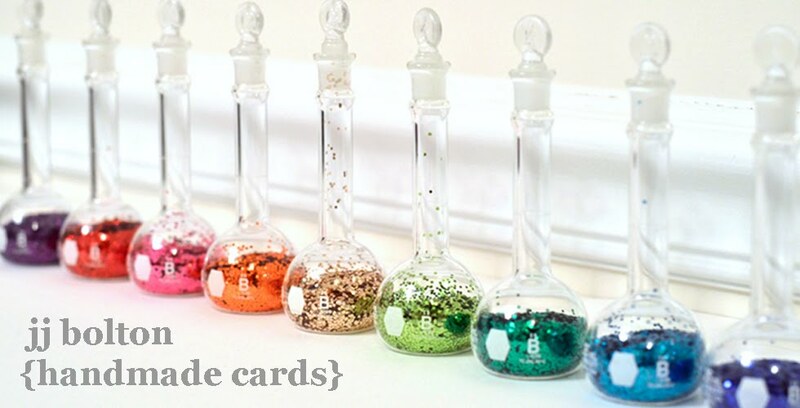 You are right.. A little glitter never hurts anybody :) Love your card.. very cute. TFS! Ohh what a sweet baby card. Just fab. OMG I love it! That sentiment is so perfect for a fun new baby card! Aww... What a super sweet card! Love it. Oh my goodness this is so sweet and the sentiment is perfect! I am already a follower of this blog! What a fun card and I love the touches of glitter!! Love the message bands, can see those getting used a lot. The Up & Away set is a favorite of mine, too, this is so simple & sweet. TFS! Hmmm.. I need to get myself a glitter pen! :) This card is gorgeous, thanks for sharing! Although I am a little elephant, I still think this bear with the balloons is adorable. Makes my trunk curl up into a big heart!!! I follow my dear, dear ME wherever she tromps and tramps by e(lephant)-mail, naturally.